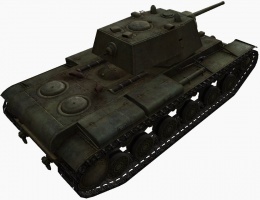 The KV-1 is a Soviet tier 5 heavy tank. El desarrollo comenzó a finales de 1938. En agosto de 1939 se fabricó un prototipo. El primer combate del vehículo fue en diciembre de 1939 en la Línea Mannerheim. El carro se fabricó en masa desde marzo de 1940 hasta agosto de 1942, con un total de 2769 vehículos fabricados. It's one of the tanks new players should definitely learn to kill as the same weak spots are shared with other tanks in the KV family. Frontal weak-spots include the flat plate directly below the turret and the lower plate below the heavily sloped mid section, and shots to the side and rear will penetrate the flat 60mm armoring fairly consistently. This tank used to be combined with the KV-2 in the removed KV tank. 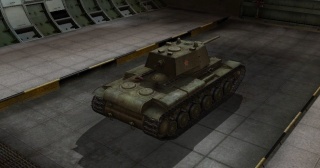 The KV-1 leads to the T-150, the KV-2, and the KV-1S. Can choose between three good guns that offer completely different styles of play with good DPM and RoF for each. Excellent armor for its tier on the front and on the sides; with 110mm thick nearly impenetrable rounded upgrade turret. Good at sidescraping, but mediocre reverse angling due to engine. Upper front glacis is very bouncy if the enemy doesn't aim. 122mm U-11 howitzer relatively consistent penetration on low tiers and can one-shot, still capable against higher tiers. 85mm has excellent fire rate, penetration, and damage, especially for its tier. Slow acceleration, and otherwise poor maneuverability: often an easy priority target for SPGs. Top speed and strategic mobility is acceptable but lower than IS-line. Slow aiming time on large guns; especially 122mm howitzer, with low accuracy and long reload time to boot. 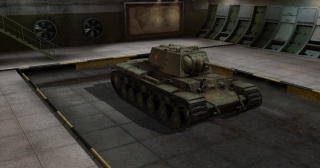 The KV-1 is one of the most popular tanks in the game. Its thick armor, generous gun selection, and easy-to-learn play style make it one of the best starter tanks and allow it to easily dominate in the hands of a skilled player. 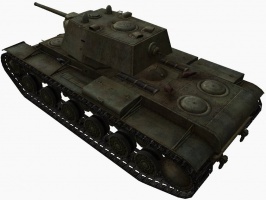 In real life, the KV-1 was designed to spearhead assaults against heavily defended areas. It was nearly invulnerable to enemy guns during its time and retains this feature in World of Tanks. 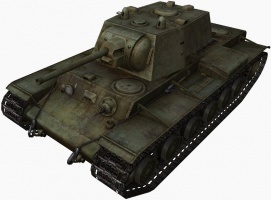 The KV-1 has very thick all-around hull armor and a very tough turret. This allows it to sidescrape with ease and withstand serious beatings. Although thick, the KV-1's armor is mostly unsloped which means the hull must be properly angled to realize its full potential. 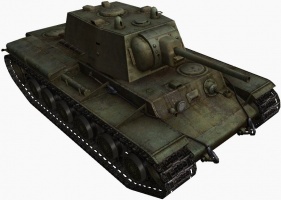 The KV-1 also offers a generous selection of guns: a rapid-firing and highly accurate 57mm; an extremely powerful but relatively unreliable 122mm howitzer, or a hard-hitting 85mm which mediates between the two. The only downside to the KV-1's guns are their slow aiming speeds; shells will be reloaded before the gun is fully aimed. Furthermore, the KV-1 is very slow and turns sluggishly. Its once-formidable armor and weaponry are much less effective against higher tier tanks. This coupled with poor maneuverability and speed make the KV-1 easy prey against Tier VIs and VIIs. However, don't let that dissuade you. The KV-1 is very fun and easily dominates when in a Tier V battle. Vulnerabilities Many players at and below tier V consider the KV-1 an impenetrable wall, and rightfully so - many blind shots will bounce harmlessly off of a KV-1, making it seem pointless to keep fighting such a powerful foe. However, with just a little more aim, one can make the KV-1's armor just a bit easier to deal with. 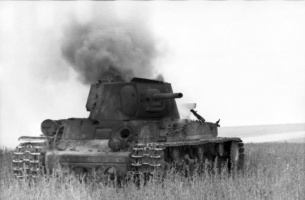 For starters, one should never shoot at the turret of a KV-1. All of it's armor is in the triple-digits, and the gun mantlet covers two thirds of the front turret, providing spaced armor atop of the already strong turret. The sides and rear of the turret are more manageable, but penetrating these parts can only be reliably done with guns of over 110 mm of penetration. However, the hull is much more juicy. On paper, the tank seems formidable, as both its front and side armor are set at 75 mm, meaning a KV-1 putting itself at a 45 degree angle to you would seem to have made itself an iron wall. 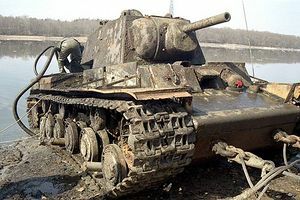 No fear though - there is a machine gun port sticking out of the front of the KV-1, and by shooting at it, you completely negate any angling done by the KV-1. If the KV-1 angles its front further to conceal the machine gun port, just shoot at the side. If the KV-1 is facing you without any angle whatsoever, just shoot at the flat area right below the turret which should be facing you without any angle. If you can, also try shooting at the driver's view port, giving you a chance to hamper the already-clumsy KV-1's mobility. If you have low penetration, try shooting the upper glacis. It only has a mere 40 mm of armor, but it's steep angle will mean that it can bounce many shots unless overmatched. When shooting at the side, try to avoid hitting the tracks, as they serve as extra armor. If shooting at the back with a low penetration gun, aim for the top of the rear side, where the back bulges out, as that only has 50 mm of armor, compared to the 70 mm of the lower rear. After the battle, the crew of No. 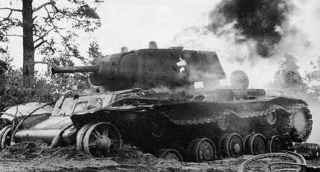 864 counted a total of 135 hits on their tank, none of which had penetrated the KV-1's armor. Lieutenant Kolobanov was awarded the Order of Lenin, while his driver Usov was awarded the Order of the Red Banner. Later on, former Captain Zinoviy Kolobanov was again decorated by Soviet authorities, despite having been convicted and downgraded after the Winter War for "fraternizing with the enemy." After the end of World War II, Lieutenant Kolobanov served in the Soviet occupation zone in East Germany, where he was convicted again when a subordinate escaped to the British occupation zone, and was transferred to the reserves. The battle for Krasnogvardeysk was covered up by Soviet propaganda. A monument dedicated to this battle was installed in the village of Noviy Uchkhoz in 1980, at the place where Kolobanov's KV-1 was dug in, due solely to the demands of the villagers. 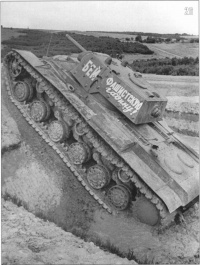 Unfortunately, it was impossible to find a KV-1 tank, so an IS-2 Heavy tank was installed there instead. The Soviet victory was the result of a well-planned ambush in advantageous ground and of technical superiority. Most of the German tanks in this battle were Panzer IIs, armed with 20 mm guns, and a few Panzer IIIs armed with 37 mm KwK 36 L/46.5 guns. 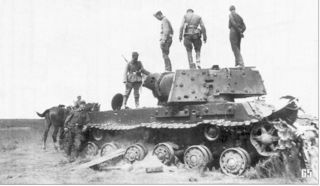 The German tank guns had neither the range nor the power of the 76 mm main gun of a KV-1, and the narrower track width of the German tanks caused them to become trapped in the swampy ground. *The 57 mm project 413 gun did not exist. 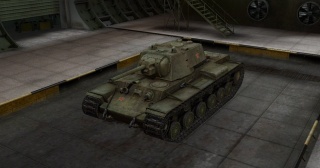 The 122 mm U-11 gun was designed for the KV-9 in a different turret. The 85 mm F-30 gun was designed for the KV-220 in an englarged turret. 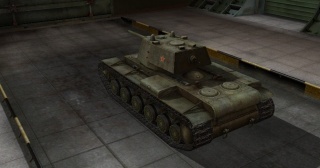 Two of the KV-1's historical armaments, the 76 mm L-11 and 76.2 mm F-32, are missing.